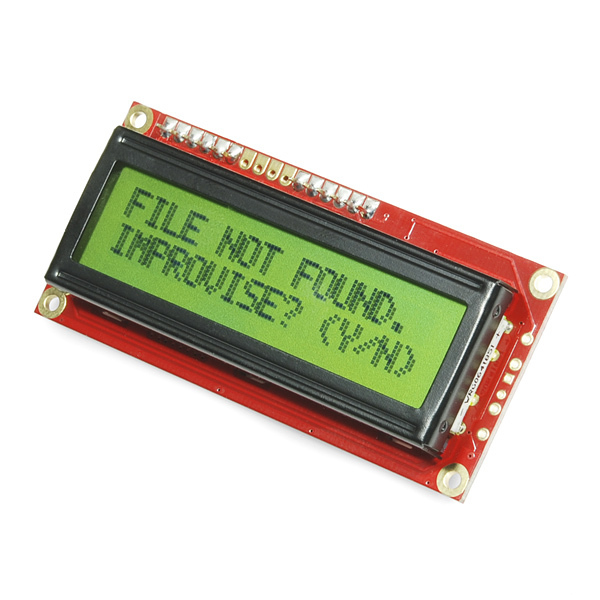 For every Serial.print() , I get a bunch of || characters printed on the display after the actual text. Anyone know what I'm doing wrong here? I've set Serial.begin(9600); in my sketch. Edit: Sorry, for every Serial.println(), two || appears instead. How should I properly send it a CR/NL ? Try resetting the baud rate. If you have it connected while you upload a sketch, funny things can happen. Reset the baud rate, disconnect it while you upload code, and try again. I just ordered this and all I have to do is solder on leads or headers for the wiring right. It comes with a screw terminal, so no soldering required to get it up and running! According to the datasheet this is a 5v connection device. Not sure where the 3.3V comment comes from. 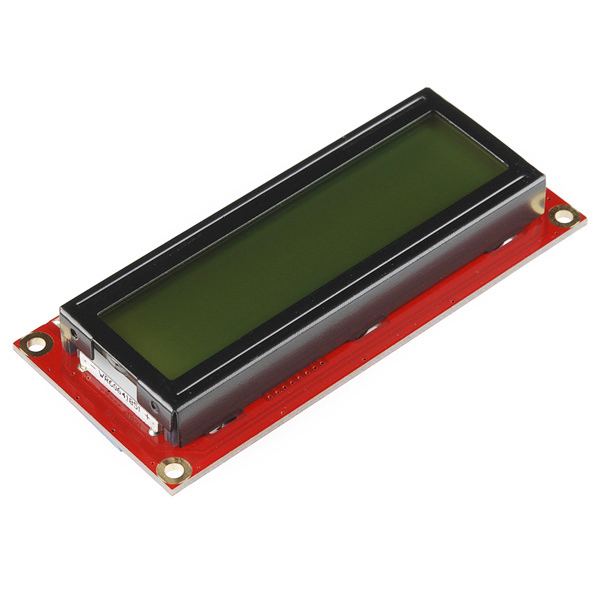 "Only three wires 5V, GND and Signal are needed to interface to the LCD." This is a good easy-to-use display, but a little hard to read when wearing polarized sunglasses, so not ideal for use in a vehicle or outdoors. The white/black version works better in those applications. I see that this device works with a 3.3V supply, but will it also work with a 5.0V supply? I checked with tech support they said "the board should only be powered at 3.3V." and that "It is equipped with low voltage circuitry that is not intended to take 5V"
I'm new to this and found the datasheet unclear and inconsistent about how to clear screen etc. No complaints regarding the functionality. I don't give it 5 stars for 2 reasons: 1) expensive (but solved my problem, so I can't complain) and 2) the daughterboard with the serial driver, attached behind the display, is rather bulky, which may complicate many installation scenarios. 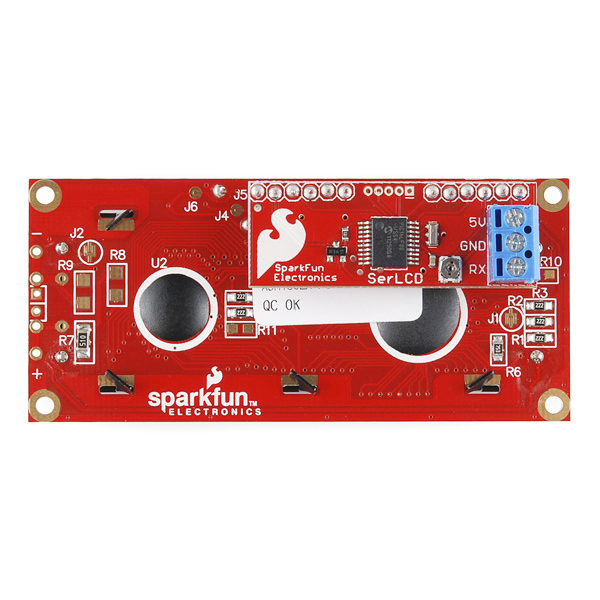 The pictures in Sparkfun don't reveal this issue. 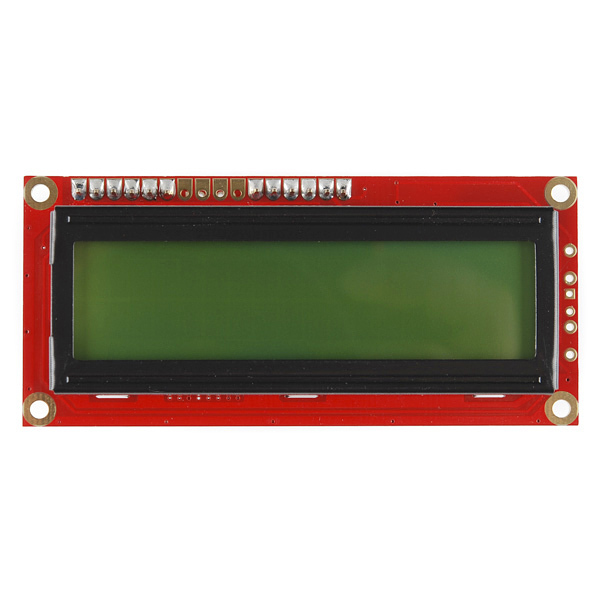 If the photo from behind was taken at an angle and not straight down you'd see the daughterboard and screw terminal add approximately 1/2 inch to the depth of the display. It was pretty easy to get up and running with the Serial enabled display. I have had difficulty getting some of the commands to work such as changing the splash screen and the back light, but for quick and dirty prototyping, this is a definite time saver. As the previous reviewer mentioned the daughter board and the screw terminals are bulky. In my situation, it is not an issue. I thought the three wire interface would be very simple, however to use this with an Arduino Uno you need to give it 3.3v and also use a LLC to communicate at 3.3v TTL. Even after giving it the correct voltage, TTL voltage, and baud rate the screen did not work correctly. I tried two screens and neither worked. I tried using a different Arduino and it still did not work. I would not buy this again. Sorry about that! The 3.3 volt version was made specifically for use with a 3.3 volt system rather than a 5 volt system like the Uno. but we do have a 5 volt version that works great with an Uno or other 5 volt micro controller.